Former prime minister Tony Blair has launched a faith foundation to tackle global poverty, challenge conflict and unite the world's religions. 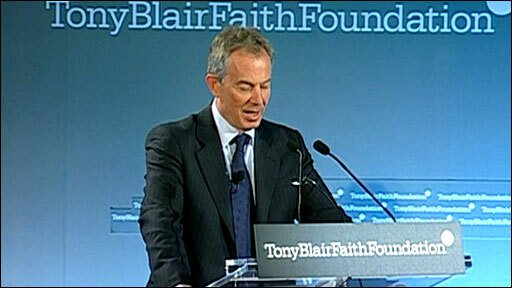 Mr Blair, who is a Roman Catholic, unveiled the foundation in New York. 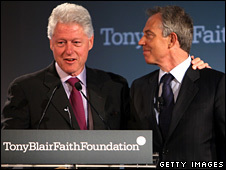 The Tony Blair Faith Foundation has three aims: to promote faith as a force for good, improve awareness between religions and tackle poverty and war. Mr Blair said there was "nothing more important" than creating understanding between different faiths and cultures. At the launch in New York, he said: "The characteristic of today's world is change. The consequence is a world opening up and becoming inter-dependent. "The conclusion is that we make sense of this inter-dependence through peaceful co-existence and working together to resolve common challenges. "We must be global citizens as well as citizens of our country," he told the audience of academics, media and business and religious leaders. "Idealism becomes the new realism." He went on to cite a poll which showed the percentage of people in most Muslim countries who said religion was an important part of their lives is in the high 80s and 90s, while in the United States it is about 70% and in Europe under 40%. One of the goals of the foundation was to counter extremism in all six leading religions, he said. "Though there is much focus, understandably, on extremism associated with the perversion of the proper faith of Islam, there are elements of extremism in every major faith," he said. Former US president Bill Clinton took time out of his wife's campaign to become the Democrat presidential candidate to attend the launch, at the headquarters of media group Time Warner. He described Mr Blair as "a good man as well as a great leader", saying "his own religious faith is genuine, deep and shapes his life". In an earlier interview with Time magazine, Mr Blair, who is now a peace envoy to the Middle East, said the foundation was "how I want to spend the rest of my life". The vocation is something the former prime minister has been considering for some time. But Mr Blair said while in office he feared being branded a "nutter" if he talked about his religious views.